The Rio Grande City High School library is looking to parents, community members and businesses for help in raising funds for needed resources. The library is participating in a new online fundraising program called Funds4Books, sponsored by Mackin Educational Resources, a school library and classroom vendor with 26 years of experience. A total of $4500.00 is needed in order for the library to provide students and teachers with the resources they need for reading, research and curriculum supplements. For every $20 donated, the library can purchase a new book that is ready to be shelved and checked out. Most important, 100 percent of every donation goes to the library. 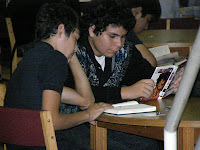 To participate, donors can go to www.funds4books.com, and log in to Rio Grande City High School’s personal Funds4Books page with the code d79c. From there they can donate via credit card, echeck or check. For those without computer access or a credit card, the library will accept “Funds4Books” checks. Mackin Educational Resources, located in Burnsville, Minnesota, created the new Funds4Books program in response to nationwide school budget cuts and a struggling economy. Mackin works with librarians to analyze their inventory and determine what additional books should be purchased to effectively meet the unique needs of the school’s students and faculty.